As the conches sounded off, the Karthik celebrations began, signalling the beginning of an entire night filled with bhajans and dancing, but most important of all, devotion for God. The first prayer was a maha abishekam on Guruji's padukas. In the Guru Gita (verse 110), Lord Shiva says to Parvati, “By the Guru’s Grace the disciple should meditate on the Supreme. 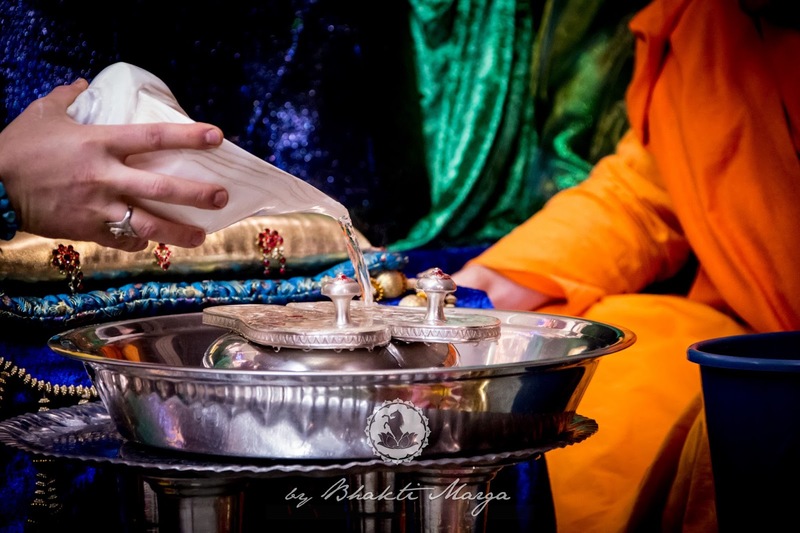 The path shown by the Guru leads to Self-Realisation.” This verse helps each of us to understand why we worship the Guru first, as it is through His Grace that we can build a relationship with God. 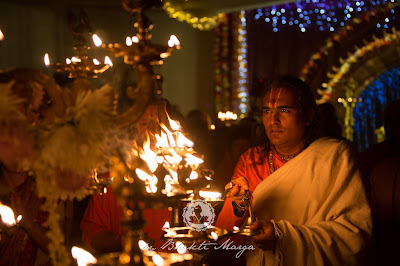 The main prayer of the Karthik Night was a Kalash Puja, which included the offering of Prasad to Lord Krishna every two hours, throughout the night. While the yagna (homa) was being conducted, Sri Swami Vishwananda arrived for the festival and sat down on his chair to meditate. Soon, Sri Swami Vishwananda began singing bhajans, and the pujaris offered an abishekam to Giridhariji, Thakurji, and a Govardhana Shila. First, welcome to this second Karthik Night. This Karthik month is a reminder of why we are here. We all know that we are here to attain the Love of God, to attain His Grace, to attain Him, to be one with Him, to be one near Him. But how do we attain that? To attain God, God doesn’t want anything from anybody outside. God has created the whole universe freely for everyone to enjoy. Do you think He needs anything from anyone? No, He doesn’t need anything from anyone. But we need it. We need Him. The reminder of that is the love which He has put inside of our hearts. This is the only thing that can link us humans to Him, nothing else. All that we do is an act of loving Him. All the prayers that we do is so that the love inside of our hearts for Him grows so that His Grace can manifest inside of our hearts. This love relationship which we have with Him, that’s what we are celebrating. We were just singing, ‘Govinda Dāmodara Mādhaveti’, no? Sri Krishna expressed that by tying Himself with the rope around His belly showing that He was not tying just a rope, but that we are all tied to Him with the relationship of love. We have a loving relationship to God. That loving relationship can express itself only by love. In love there is acceptance, there is respect. This is the only thing that can bring you closer to God, nothing else. And this is your personal relationship to Him. Nobody can do that for you. It is between you and God. Nobody can say, “Light the candles or do something and your love for God will grow.” There is no technique for it. There is no something that you can say, “Okay, I’ll make a bargain with you.” This doesn’t exist. People who think like that, that they can bargain with God, they are far away from that. 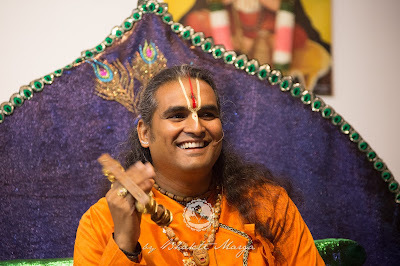 Then God becomes a businessman, you know, “You do this, I do that.” But in love you are always in deep – when you are in love you always forget about yourself, but you think of your beloved. So the same with the loving relationship between you and Thakurji, between you and God. We ask, “Lord, please shelter us! Shelter us under Your Grace. Shelter us under Your Love, in Your Love.” For what? So that the love inside of our hearts grows for Him, and in that, we forget about ourselves, because who knows oneself? But we can get to know Him. So that’s the unification. When you are dancing around, you are reaffirming this love, this relationship. The middle lamp symbolises Thakurji, Giridhari, Krishna Himself, standing there. Each lamp around it symbolises each person. Which means that we are all part of Him. We are not separated from Him. And His Grace is there. We just need to ask Him to manifest Himself. We just ask Him from the deepest corner of our hearts; let it come outside, let it manifest in the outside so that we can remind ourselves that we belong to Him and that He belongs to us. It’s not only we belong only to Him, but He also belongs to us. In this relationship, let the love of your heart expand itself, let it go into the world. Because right now you know very well what has been happening in many places. The world needs it. So this light that we are lighting is not just for here, but it’s a light for the world. Together with your prayer, together with your positive thinking, offer it to Mother Earth that really peace prevails, that this mind which understands things in one way truly understands what it really is to love and what it really is to attain God. The Karthik Night at Shree Peetha Nilaya was filled with music and dance. The women and men took turns dancing around the centre lamp, sometimes dancing with dandiya sticks, and at other times, without. The songs never fell flat during the long night of devotion, as each person had properly prepared the music they chose to perform. Throughout the night, Guruji joined in on the dancing, and also sang a multitude of bhajans in the early morning. Prasad was abundant, of course, and allowed everyone their fill of sweets as the night progressed. 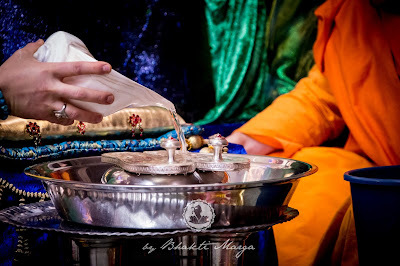 When the arati had come to a close, the lamp was extinguished by the throwing of flower petals onto the wicks. 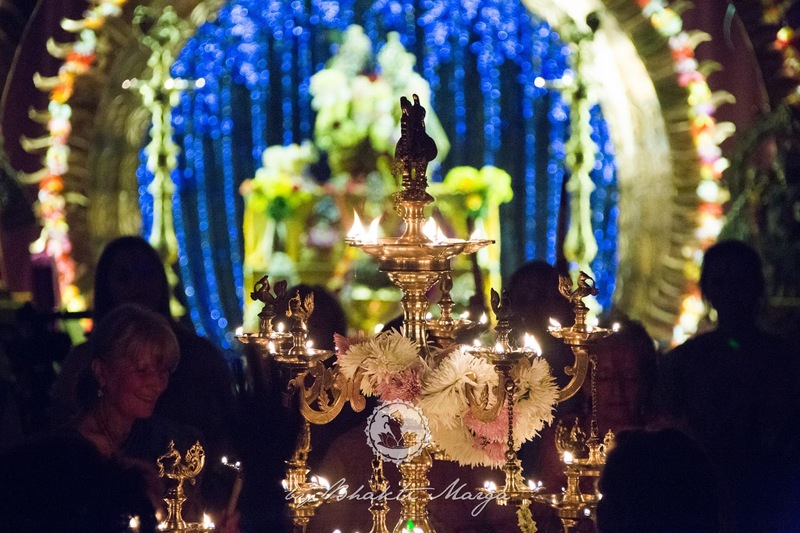 Then, each person had the opportunity to make the auspicious offering of a jasmine flower to Sri Krishna as they received their final darshan from the deity during Karthik Night.